In the late 1940s, only half of our dining table, in our house in Port of Spain was used for our meals. The other half was used for books and Cassell’s dictionaries for my brother Vidia, who was studying for a coveted island scholarship to university. His four sisters’ studies waned in importance. Vidia won the scholarship and was accepted by University College, Oxford, to read English. In 1950, he boarded the plane to head for England, without ever looking back or waving. Our younger brother, Shiva, thirteen years Vidia’s junior, eventually followed the pattern, winning an island scholarship and a place at Oxford, too. In 1956, Vidia returned to Trinidad for the first time. At the age of eleven, Shiva was so proud of this almost mythical brother come to life, a father-figure replacement after our father, a journalist on the Trinidad Guardian, died in 1953. He could recite chunks of The Mystic Masseur – Vidia’s first novel - in honour and in awe of his brother. Sadly he would gaze at a brother who demonstrated little affection and less tenderness for him. Shiva’s image of Vidia would scarcely change over the years. While he admired the work and was in awe of Vidia’s achievements, he was not charmed by the man. Shiva was affable and warm. About Vidia he had some sentimental ideas. He used to think rather warmly that they would be like the Huxley brothers, Aldous and Julian. When he left for Oxford in 1964, Vidia and his first wife Pat were also in England. For most people, admission to Oxford or Cambridge University is like being given a master key to a secure future. Vidia, however, had left Oxford ten years before apparently without any fond memories of his time there. Anxiety and hardship, along with his mettle and tenacity, or a sense of privilege, drove him toward achieving his grand design to be a great writer. Vidia, wishing to save Shiva from some of the pitfalls he had encountered, instead brought added pressure, rather than soothing enlightenment, to bear on him. Shiva himself seldom complained about either Vidia or Oxford, but instead brooded silently on his unhappiness. In the end, his relationship with his brother became a source mainly of pain, when it could easily have been otherwise if Vidia had been a different, more loving and generous person. 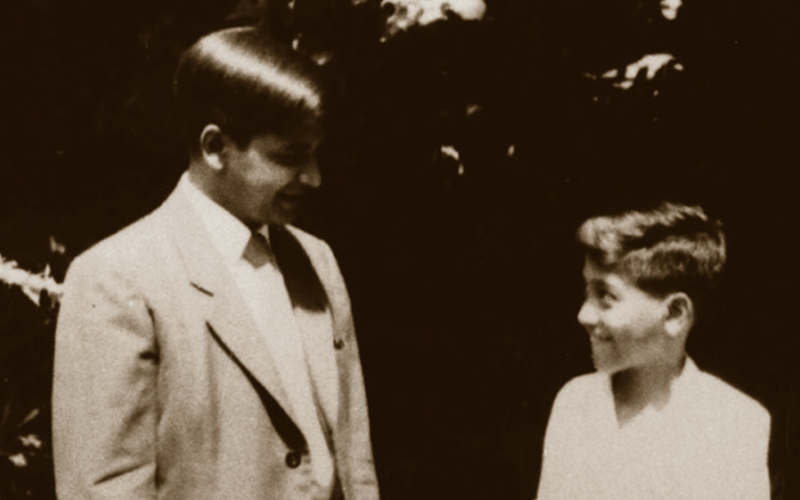 In Shiva’s essay, ‘My Brother and I’, published in his posthumous volume An Unfinished Journey, he set down what Vidia had meant to him as a newcomer at Oxford and in the years that followed. When Vidia came to Trinidad, it was always on a writing assignment. He was never on vacation. Trinidad was, more often than not, a port of call. He would stay with me and my family in our house in Valsayn, outside Port of Spain. His visits coincided with the formative years of our children. To our children, Uncle Vido (as they called him) was ‘strange,’ ‘odd’, ‘impossible’ or just ‘plain nuts’. They were not in awe of him, but they also never disrespected him in our presence, much less to his face. ‘Clear the battlefield!’ he would declare as they ended breakfast and set off at 6.30 am for school. One morning in the early 1970s, right after his return from one of his writing trips to Argentina, for the first time that I could remember, Vidia knocked on my bedroom door and asked me to delay my departure to Port of Spain. He needed to talk to me. I was jolted when he spoke in revealing detail about some apparently mesmerising sexual encounters, starting in Argentina, he had enjoyed with a woman named Margaret Gooding (or Margaret Murray - she used both names). I did not know what to say; how to react. My eyes must have opened like two saucers. I confess that I was not sufficiently versed in the ways of the world to participate fully in the conversation. All the same, this revelation about unbridled, extra-marital, sexual pleasures, initiated by my self-proclaimed ‘ascetic’ brother Vidia of all people, left me stunned. With time, Vidia become ever bolder in flaunting his relationship with Margaret in public. In Trinidad, he took her everywhere and stayed with her without fuss at one of our leading hotels. Margaret’s only wish, according to Vidia’s words, was to hang her clothes in his cupboards in Wiltshire. One afternoon, my eldest sister Kamla arrived at our home and announced that Vidia and Margaret were on their way to Trinidad. Her mission was to suggest that Mel and I should house them. Our refusal, for the most obvious of reasons (our children were all at an impressionable age, and we felt that to have Vidia in the house with an unknown woman was a bad example to set), caused the biggest altercation I have ever known in this family, and a fracture that never quite healed. Kamla announced to Vidia that no one in the family, apart from her, wished to have him in their home again. This falsehood led to the sad situation that no one, including our mother, would meet or see Vidia until my sister Sati’s sudden and untimely death in October 1984. For almost ten years, he communicated only with Kamla. He would tell people, both in Trinidad and abroad, that he had only one sister. Meanwhile, Fireflies, Shiva’s first novel, was published in 1970 by André Deutsch. It is now a Penguin Modern Classic. Other acclaimed novels and non-fiction works followed, but sadly his literary career was cut brutally short. He fell dead of a heart attack in his and his wife Jenny’s flat in London in 1985, aged 40. We bore our grief and mourned our loss of one so young, so loving and so beautiful as a son and brother. Vidia erupted in eczema, caused perhaps by remorse for not being compassionate to his much younger brother, who had grown up without a father and had once idolised Vidia and sought his approval and love. As for Vidia, following almost immediately upon Pat’s death he married a new wife, Nadira, from a distant land. The twenty-year-old saga of Margaret of Argentina appeared to be over, or dormant. The new wife from a distant land was now hanging her clothes in his cupboards in Wiltshire.